So I decided to make my own & I LOVE it soooo much I made another for both boys AND one for Addie as a thank you for being my model in a previous shoot. The pattern you will need can be found HERE. Taking your pile of panel pieces (say that 10 times fast!) one by one you are going to connect them to each other. Take 2 pieces and place them right sides together lining up the edges. Now fold it in half so that right sides are together and pin. Sew along the edge connecting the last two pieces together and making s circle. Now you are going to repeat the exact same process for your bag lining. You should now have two unlined, sort of bags :) At this point I embellished the front with some felt and rhinstones. It just lays a little flatter and makes it easier to work with but you can do it at the end if you like. Take your batting and cut a strip as wide and as long as your bag. Sew the ends of the batting together to make a circle. Slide your circle up over the WRONG side of your lining portion and pin just below the top. For Addie's I wanted it to be green so I needed to make one. I took my long strip of fabric and headed to the ironing board. Fold over and iron both raw edges all the way along. Then fold the entire thing in half lengthwise and iron. Usually I use this technique for home made binding but today we will sew along the open edge and create a handle. Once you have it sewed shut you are going to pin it to either side of your bag. I also wanted a ruffle around the top so I made one and attached it all the way around the top edge making use right sides were together. Now, take your lining piece and turn it inside out. Slide this up over your main piece with is right sides out. This should make them right sides together. Now sew around the top edge leaving an unsewn space so that you can flip it all out. Once you have sewn around turn the bag right side out. Make sure before you do this to remove ALL PINS. Now topstitch what you just sewed sewing shut the opening in the process. I wanted to personalize hers but did not have enough corresponding felt to cut out letters so I turned to glittery paint. I was really excited about Evie's costume. 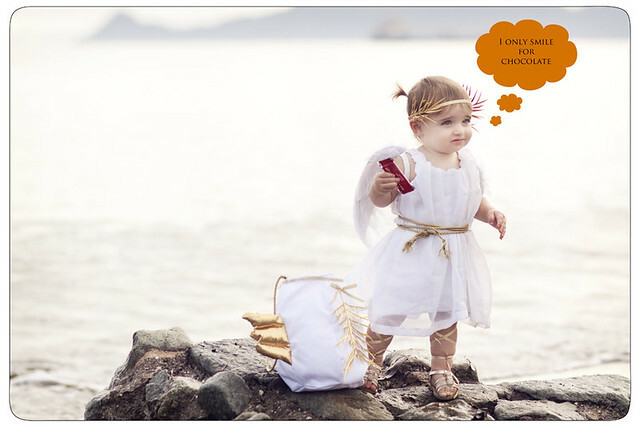 I originally wanted her to be cupid but my main goal was to use everything local to make it. 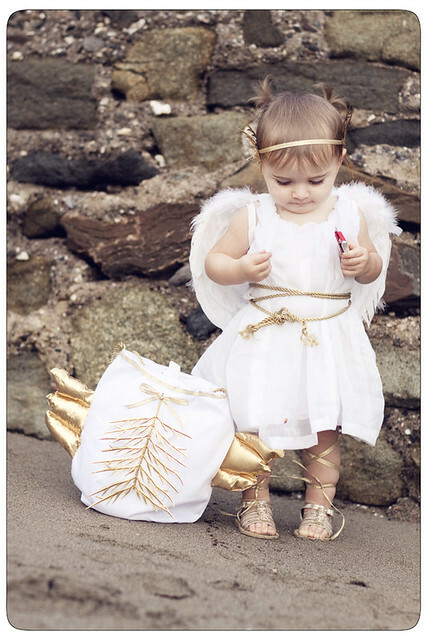 I couldn't figure out how to make a cute bow and arrow with out gold spray paint thus she became a cherub. Oh and her shoes are from Target... everything else though ha! I stuffed the treat bags with grocery bags and then hide a few treats on top hoping that would be a good enough bribe..
Once Finn saw his bag he no longer wanted to be spiderman (which we ordered MONTHS ago) but a ghost, which took me all of two seconds to make. He was so cute and just kept saying trick or treat!!! over and over. My hubby kept asking him to smile bigger and he would so try it was HILARIOUS. Sawyer is dying for a skeleton costume now, not Optimus Prime but that takes longer then 2 seconds ha! What is so funny is here we were on the beach at 7:15am in full get up and I totally forgot to get one of all 3 of them together. 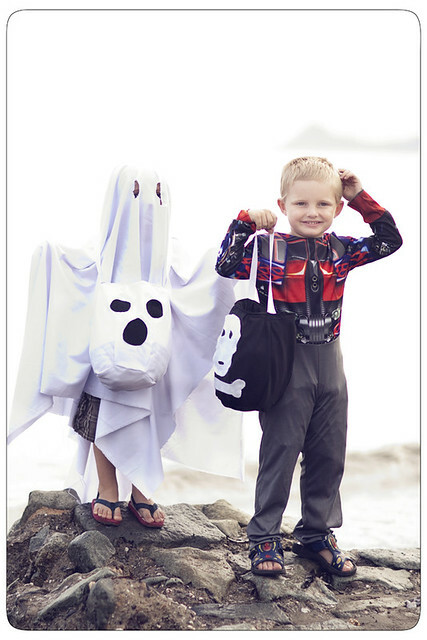 Oh well, there is always actual Halloween right? 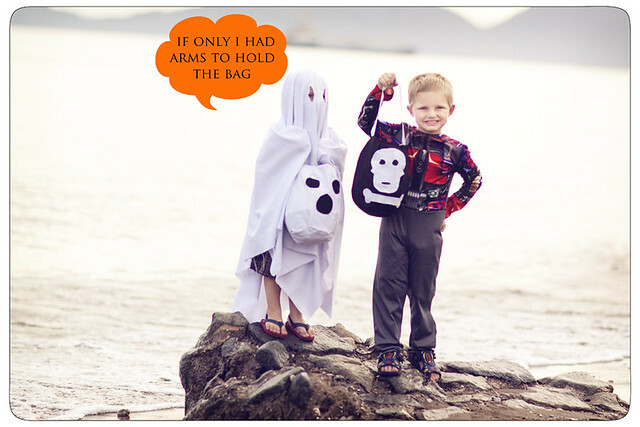 Hope you make a fun treat bag! I meant angel. Okay...last comment. Sheesh. These photos are so GREAT! What a fantastic idea! 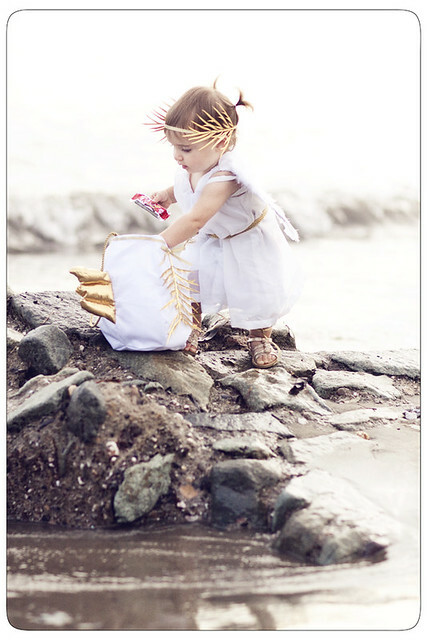 I love the photoshoot and the costumes are so much fun (love, love, love the cherub)!! They are going to have so much fun! these photos are just so cute! 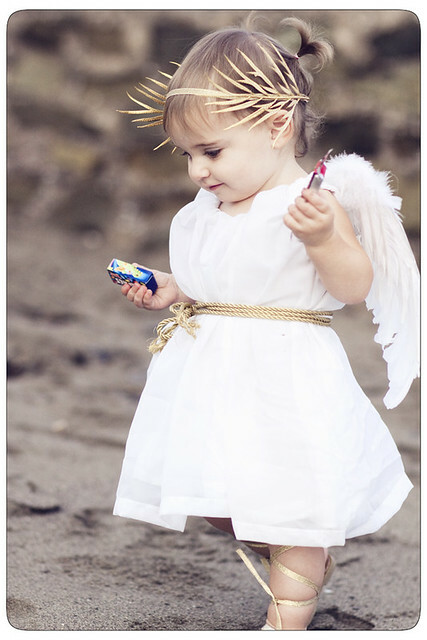 The angel costume is adorable! Excellent tutorial and pictures. I have made a felt pumpkin halloween bag for my shop and it's a big hit! OMG! How cute!!!! Love the costumes. Love the bags. I splurged on one of those pottery barn bags 2 years ago. But they only had one in the store so poor Belle missed out (because she was too little to realize it was special 6 months at the time). This year I've been looking at it wishing I could afford to get sweet Belle one...But now I can make one! YEAH Kelly! Thank you sooo much for posting this! The one we have is made out of felt so we might go that route instead of fabric! No lining, no surging...yeah for short cuts! PS. 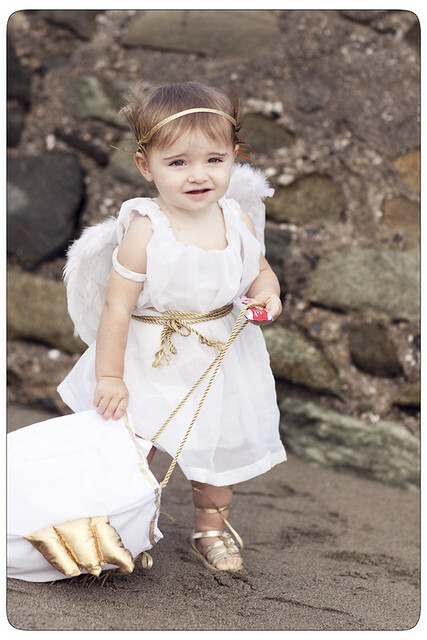 Hailey looked at the pics of Evie in her costume and said "oh, it's a baby angel!" so sweet! She totally didn't even realize that she was in her Halloween costume. Which really is adorable! You are my new favorite blog!!! I love everything you make and you've inspired me to get my tired, pregnant self off the couch and sew again. Evie's costume is so creative and adorable - the little gold ribbons up her legs just kill me, they're so cute! BEST COSTUME EVER!!!!! She really is adorable. I wish my girl was more girly, but she wants to be Batman... I love her to bits and pieces regardless of course! ;) Great blog! STOP IT. 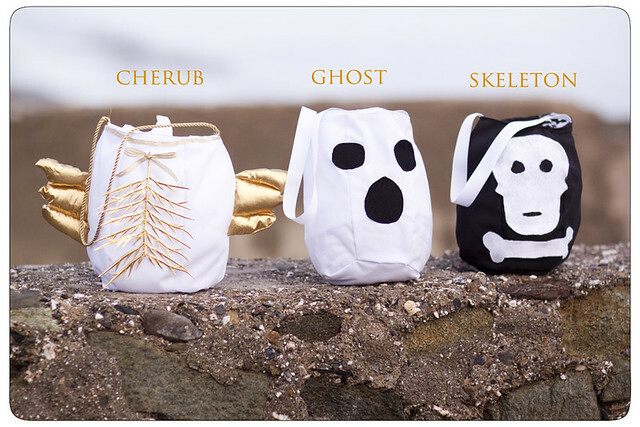 These are probably the cutest Halloween bags I've ever seen! And they can be adapted for so many other things as well! I've added this to my roundup today. Thanks so much for sharing!